Can You Live Under the Sea? A whole new world awaits man under the seas. Not a dream any longer, it is coming closer every day. “SHALL we take the sub-train down to Sea City?” you ask. You follow the crowd of commuters into the pressurized transparent cabin, much as you would enter an elevator on the top floor of a skyscraper. The door is closed. The atmosphere becomes almost imperceptibly darker as the stewardess turns on the light-conditioners to accustom your eyes to what is coming. A soft hissing sound informs you that the breath-conditioners are also on. Yes, the light in space around you is controlled, and so is the air you breathe. So accurate are the controls when the motors begin to purr and the actual descent begins, that you do not even notice the change. People used to swell up at the joints and die trying to do what you are doing now. Thanks to science, you are enjoying the thrill of vertical descent to the ocean floor in perfect comfort. Fish, large and small, silver and blue and gold, plain and striped, with weird designs, saw-toothed or hatchet-faced or just everyday fish, swim up to the transparent walls of the Aquascender shaft. You glimpse phosphorescent creatures rippling electrically among watery weeds and ferns, flowers delicately white and yellow and red, and rocks and grottos, strangely shapen, overgrown with sea-moss, coral and vines. Then, faintly visible, rising from below, you see the transparent, watery spires of Sea City in all its enchanted reality! It is built of the same substance as your Aquascender car and the shaft through which it has made its descent—a new, transparent plastic, stronger than metal, made to withstand the terrific underwater pressures. These are the “Buildings That Breathe” as they are known in the world of earth and air above. The Aquascender comes to a gentle stop. You step out into streets that also breathe within the transparent tunnels that enclose them. All the undersea structures, harder and more solid than those of the earth above, literally “breathe.” They use compressed air lungs, just as your Aquascender uses. All are regulated, floor by floor, to harmonize your bodily organism with actual conditions of undersea living, working, playing, venturing. Through it all you remain dry as powder —that is, provided you want to. 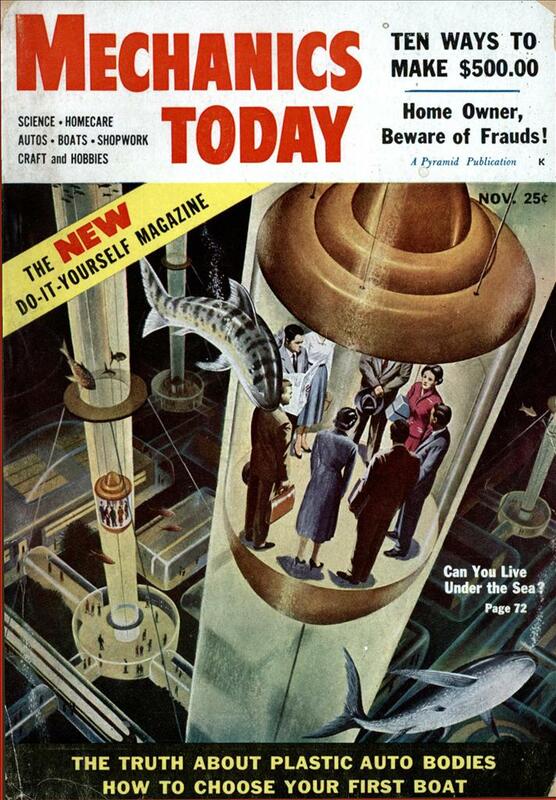 You can also don your own fins, artificial lungs and water-weights and go out among the “workers in the field,” swimming about like veritable mermen and mermaids, drilling for oil, cultivating agar, kelp and strange mosses in lush undersea gardens, photographing the treasure of a sunken ship or of a submerged Atlantis! Does this picture of a possibly not-too-distant future seem fantastic? Do you think it is impossible? If so, it is because you do not realize how far undersea science has gone toward this very development right now! The picture is not only possible. Much of it is a thing of the present—not the future! The vision of almost unlimited periods of submersion has now become a fact, with the actual development of an apparatus which manufactures oxygen from purified sea water. The Navy has awarded a $150,000 contract to a company to build the device for use in submarines. With a continuous supply of freshened air, and fuel from an atomic pile, submarines will be able to remain submerged for two years at a time without having to surface at regular intervals to revive the atmosphere and charge batteries. The adaptation of these principles to other structures surely removes the aura of fantasy from the possibility of a city under the sea! Until fairly recently it was thought that the bottom limit for safe “skin diving” was thirty-five feet and that a diver going farther might come up with a terrible case of “the bends.” The cause was the rapidly increasing pressure of the water with increasing depth. Nineteenth-century British Admiralty researches placed the increased water pressure with each foot of descent at .44-pound per square inch. No human organism could stand it. Investigators found that increasing pressures at greater depths caused proportionately greater quantities of nitrogen in the inhaled air to dissolve in the bloodstream. Nitrogen thus “occluded” in the blood was harmless as long as the diver stayed down. The damage started with his reascent. A quick return lessened the pressure so fast that the compressed nitrogen expanded and foamed like soda water in the blood. Bubbles blocked off the smaller capillaries and forced them to burst. If large bubbles lodged in the valves of the heart, it stopped beating and death ensued. The remedy proved to be gradual reascent. Returning from a 100-foot dive, the diver paused for a half-hour at 80 feet, then for a certain time at another level, and so on. The nitrogen in his blood thus was given time to become decompressed and gradually escape. Statisticians computed elaborate “decompression tables.” The diver had but to consult his chart to calculate how many hours he should take to reascend from a dive which required only a few minutes. The deepest descent ever made was that of William Beebe and Otis Barton in Bermuda waters in August, 1934. Beebe’s famous “Bathysphere,” a spherical structure of thick steel, with windows of quartz, whose coefficient of expansion is almost identical to that of steel, went down 3,028 feet and despite the terrific pressures at that level returned intact to the upper world. From 670 feet downward, plant life was no more, and an important door to the upper world was closed, though he was constantly giving descriptions and instructions by telephone to his co-workers above. Here the fish were often powerful, colorful, sometimes of giant proportions and often highly luminous. Some of them bore lights like traffic signals on special tentacles protruding from their bodies. At 1,680 feet one of these luminous fish suddenly “exploded” in the inky water right outside the quartz window of the Bathysphere. Later there were other “explosions,” all with blinding flashes of light, and only after repeated experiences of this phenomenon did he learn that a flame-throwing shrimp was defending itself by literally pouring a stream of flame out of its body to drive away some terrible-toothed marauders of the deep in one of nature’s wars deep-hidden from the eye of the upper world. The teeth of some fish a half-mile down were shiningly phosphorescent, with black interspaces between the teeth and bodies that seemed now like transparent veils or again deep black like the water itself. As such information is garnered by the courageous scientists who go down to the depths and report what they have seen, the big question mark in our knowledge of the ocean is gradually being reduced. In experiments at Marquette University in Milwaukee, Max Gene Nohl, Captain John Craig and others built their own laboratory pressure chamber and lived in it to test on their own bodies the possibility of breathing new atmospheres containing inert gases other than nitrogen. An oxygen-helium atmosphere was found best because helium did not “occlude” in the blood. Further research showed that the effects of carbon dioxide, which can accumulate disastrously in the lungs at depths of 200 feet and lower, are surmountable by proper pressurizing. Thus we have learned to avoid the so-called “rapture of the deep” from which less experienced divers have suffered —an intense and intoxicating dizziness which may cause the diver to ignore danger by going down still farther after his attack or even losing his breathing and other mechanical equipment and plunging to death. Some undersea men have advocated the fish’s breathing method for man—the inhalation of oxygen directly through the water by means of artificial gills. But the human organism cannot endure straight oxygen, and the technical problem of blending it with an inert gas such as helium has not yet been mastered. The “Aqualung” used by Captain Jacques-Yves Cousteau and his French associates embodies regulation of the flow of compressed air in ratio to depth and exterior pressure. Along with whatever breathing contraption the “skin diver” may take down with him, he may use such mechanical aids as weights to offset natural buoyancy and flippers on the feet. The problems of underwater communication are rapidly being solved. It has been found that a throaty speech sometimes aids communication under water because it sets up bone vibrations. Bone oscillators, transceivers, tank microphones and helmet telephones have been used effectively. 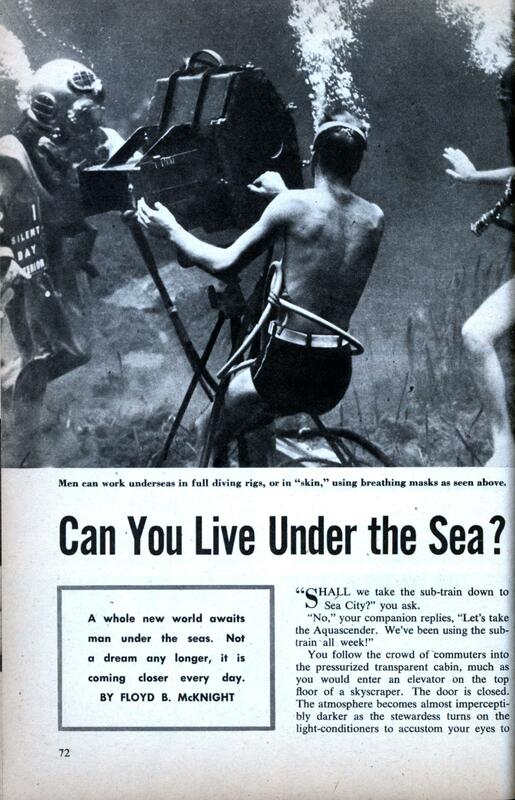 Television, too, has been successfully applied to undersea communication. A surface monitor screen can give a constant picture of the scene being photographed below. The Marconi Wireless Telegraph Company, in association with Siebe, Gorman and Company, Ltd., has used this principle in England. A Marconi image orthicon camera is equipped with remote controls to govern focus and lens aperture. A water indicator warns of any moisture in the camera’s pressure casing and all cameras and equipment are pressurized to protect them from being shattered by the strong pressures. A compass and an inclinometer are a part of this TV equipment, and infrared lighting has been suggested to overcome the difficulty of photography in muddy waters. The United States Navy’s Ordnance Laboratory has used highspeed photography to study the effects of underwater explosions two miles down. With explosion detonation, camera “shooting,” flash and aperture control automatically synchronized to milliseconds, the photographers took pictures at a rate of 20,000 frames per second, giving the Navy needed information at nominal cost in contrast to the $500,000 that construction of a tank adequate for the experi- ment would have otherwise required. Modern science and industry have launched a joint endeavor to conquer the sea, as they have the land and air. Actual undersea conditions are produced in laboratories, such as the 125-gallon duplicate of the ocean bottom in a downtown New York skyscraper. Here, Western Union engineers have artificially created the black, freezing, high-pressure depths nearly two miles down in the North Atlantic within a five-ton tank with four-inch-thick steel walls. The operation of delicate undersea cable amplifiers for installation on the ocean bottom may now be carefully tested under “actual” conditions far from the ocean. With such developments already thought out and used, what obstacles remain to the construction of man’s undersea city? Certainly, none that cannot be overcome! For years, industry has produced reinforced plastics that are stronger than metal. It has manufactured synthetic substances with other needed properties almost at will. A few more steps, at most, will produce the desirable building materials for the city. Perhaps at deep levels the structures will be portable, movement being easier there because of the greater buoyancy of the water. The shark problem is less menacing than some hair-raising accounts suggest. Man is by no means ignorant of shark behavior. The presence of blood in the water makes the shark ferocious. Otherwise, unless the creature is exceedingly hungry or has been hurt by a man, it will not attack him. The known repulsion of sharks by the presence of a dead shark in the water led to an interesting discovery in World War II. Aviators over the Pacific were far more fearful of sharks than of drowning, and it was found that the dead shark developed in its. body a substance which the living shark did not possess. Dow Chemical Company researches produced this substance synthetically, so that it might be dumped from planes into the shark-infested waters whenever a plane went down. Thus man’s knowledge has gone far toward conquering this last remaining frontier of the physical world. And why should he bother? Well, on the materialistic side there is untold wealth! With Near Eastern oil threatened, the exploits of drillers operating clumsily from ships off California and Texas have gained attention, and undersea science will make possible actual drilling on the sea bottom. Commercial values are there. They gained official recognition when President Dwight D. Eisenhower granted, and both houses of Congress passed bills confirming, states rights to all mineral resources in the tidelands areas and perhaps further out to sea when the law is further defined. Thus, the states affected have gained mineral rights to a ‘”sea” of wealth. It is estimated that full scale oil well operations on these underwater “tidelands” can eventually produce about 200,000 barrels of petroleum, as well as 600 to 800 million cubic feet of natural gas, each day. During the course of these activities, the discovery of new major oil and gas fields will continue to offer fresh sources. In certain deep ocean areas lies the primordial ooze, an eight- to ten-foot film thought to contain the makings of plastic materials. Portions of it are radioactive. Samples already entrapped prove that this layer is a rich source of oil. It is now believed that nearly half of the oil remaining in the earth is still stored in large pools beneath the oceans, within ancient coral or shell reefs and in “traps” under the sea floor. Many minerals of the undersea are known. Manganese, so essential in our industrial civilization, is present in thick crusts on the rocky summits of submarine mountains. Only one such sea mount in the central Pacific is estimated to contain fifty million tons, ten times the present annual world production. The rising standard of living throughout the world may well exhaust our present sources of iron within the next hundred years. Magnesium extracted from the sea, the likely substitute, offers a source of supply sufficient for over ten million years. Gold deposits run out to sea, often for considerable distances. A cathode ray tube, showing radar reflections in terms of brilliance, might easily locate them. It is estimated that if the quantity of gold in sea water were all extracted and distributed equally, each man, woman and child in the world would receive an amount worth about $4,000.00. (Before taxes.) The famous German chemist Fritz Haber was the first to draw practical conclusions from the fact that sea water is an inexhaustible source of gold. He was charged with this task by the German government during World War I, and succeeded in working out an extraction method, but was not given the opportunity to perfect it and make it economical. After the war ended no further funds were available for the project. The fact that gold is highly diluted in sea water does not mean extraction can’t pay. There is a plant called horsetail which has the property of accumulating gold by selective absorption. These plants might be raised on “plantations,” and the gold extracted from them. Coal companies, too, have tunneled out from land to mine under the water, and have also drilled directly from the sea bottom. Incidentally, a better-burning coal results from sinking it so that it may absorb salt, as anyone knows who has observed the effects of “bunkering” it beneath water-level on a steamship. Ambergris, malodorous carrier base for delicate and expensive perfumes, originates in the stomach and intestines of the sperm whale. With new access to the medicinal oils of the livers of the cod and whale will come a new scientific understanding of the plankton, those near-microscopic creatures which absorb sunlight on the surface of the water, then are eaten by these big fish which in turn give sunlight and vitamins to man through cod and other fish-liver oils. Varying temperatures of the water at different levels can produce the power for man’s undersea activities, and the most forward-looking explorers of the deep envision manufacturing their own power supply below the surface. Long ago Simon Lake espoused underwater freight to save energy and expense, because he saw the economic value of loss of weight of heavy objects during transportation. Strategically, supersonic signal stations could be built well out from shore, and a photoelectric fence could help warn of enemies and keep them out. One fantastic but not impossible dream of earlier undersea enthusiasts was the diversion of the warm Gulf Stream where it meets the cold Labrador Current at the Grand Bank, east of Newfoundland. Engineers believed that at this point it would not be too difficult to direct these currents and change the climates of continents, so that palm trees might line Fifth Avenue! The triumph of undersea science is not one primarily of new gadgets and devices, although these are important, but of recognition of a set of laws apparently different from the natural laws which govern life on land. “Drop” an object undersea and it rises instead of falls. The force of gravity becomes the force of levity—the more so the deeper one goes, and very rapidly more so. The scientist is learning to use these phenomena to advantage—and in many respects his job is an easy one. Underwater lighting, for example, is much simpler than dry-land lighting because the heat generated by a burning electric bulb in an ordinary air medium is tremendous, whereas water cools the bulb so that a 1,000-watt bulb under the sea need be no larger than a 60-watt bulb on land. Man has conquered practically the final obstacles standing in the way of his new adventure. Arthur Carpenter, a member of the board of governors of the Explorers’ Club, in collaboration with a group of explorers, scientists and engineers, has created an actual undersea station in which ten or a dozen men can go down to depths of 100 feet or more and live there even for several weeks at a time if they so desire. Another explorer, J. E. Williamson, has stayed overnight in his underwater sphere anchored on the seafloor off the Bahamas. His sphere, six feet in diameter, is even recognized as an undersea post office of the British Government as long as he keeps it there! Within the next few years, the undersea will become more than an overnight lark, a post office for tourist parties or a place for a casual dive or photographic trick. That is because the scientist, the technologist and the engineer have taken over. Yesterday, the “city under the sea” belonged to the researcher and adventurer. Tomorrow it will belong to you and me! Jacques Cousteau tried to make habitats under the sea, then robotics proved to be more cost effective. Almost my entire life (since 1952) I’ve seen these proposals for ‘cities under the sea*’ but except for a few oddities and research stations they have never panned out. *and I’m ready for my personal jet-pack and flying car as soon as it’s ready, dammit! @StanFlouride, polish up your credit cards: http://www.martinjetpac… they’re only $90,000 or so.